Looking for the perfect place to stay in downtown Minneapolis with the perfect Twin Cities skyline? Radisson Blue Minneapolis Downtown has an outstanding location and is the ideal hotel for travelers. During a recent father and son trip to Minneapolis, I had the opportunity to stay at the Radisson Blu and it did not disappoint. During your stay at the Radisson Blu Minneapolis Downtown, you’ll find that you’ll be walking distance of Target Field, the theaters of Hennepin Avenue, Target Center and U.S. Bank Stadium. It’s the perfect location for taking in everything the Twin Cities has to offer. There are many restaurant options but we loved the Firelake Grill House & Cocktail Bar, located at the Radisson Blu. You’ll enjoy farm-to-table dining and dishes prepared with local Midwestern ingredients. I was amazed at the direct access we got from the Minneapolis Skyway system. During our stay it was cold, rainy and it was the perfect way to get around where we needed to go downtown. The Skyway system actually connects 69 full city blocks over 11 miles of Downtown Minneapolis. Amazing! We were able to walk in climate-controlled comfort which was perfect for the cold weather. We walked right to Target Center where we watched a great baseball game of the Minnesota Twins play our favorite team, the Kansas City Royals. We even caught a foul ball! The Radisson Blu offers 360 stylish rooms and suites offer amenities such as free high-speed, wireless internet, Lavazza coffee, a laptop safe and a refrigerator in each room and suite. You’ll also find options for breakfast, lunch and dinner, including the on-site FireLake Grill House & Cocktail Bar. The staff of the Radisson Blu were exceptional and the room did not disappoint. It was the perfect stay for any weekend getaway. The room was stylish and clean. We couldn’t have asked for anything more! We loved the complimentary This Works® bath amenities, Lavazza coffee and Rishi tea. The staff even surprised with an amazing gift tray during our stay including cookies, grapes, wine, bourbon and milk! It definitely won us over! Be sure to check out our last minute Father’s Day gift ideas. Our stay at the Radisson Blu was the perfect father and son getaway. Try it for your next guy’s trip. You will not be disappointed! Or, it’s perfect for a girls weekend, family stay or business trip. 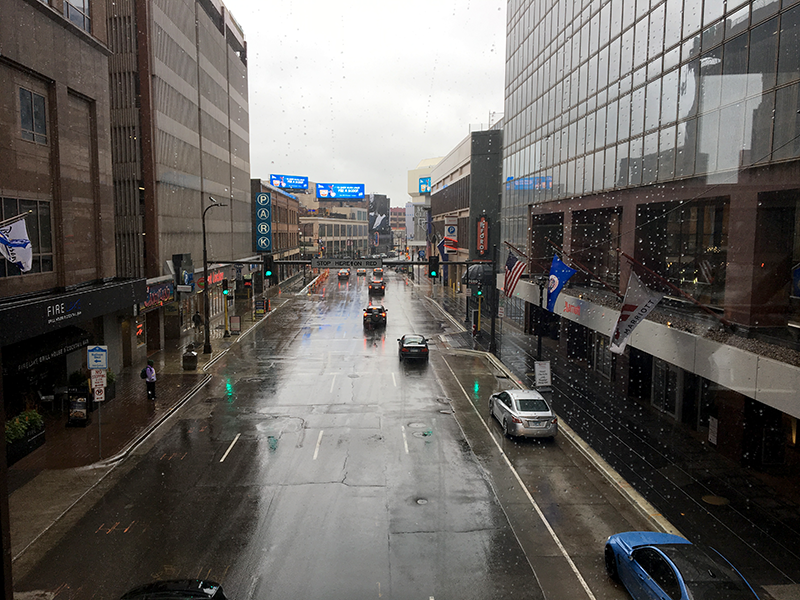 Have you stayed in downtown Minneapolis? If so, comment below and share your experience!